I watched Littley the other day, piecing his way along the narrow fences between the chequerboard of gardens that lie between my road and the next. Each territory, marked by parasols and greenhouses is both sacrosanct and shoddy and I feel like a spy as I stand on a stool and overlook the personal space of my neighbours – most of whom I don’t know (even though I have lived here for over twenty years). …Littley went down to touch noses as usual, but the ginger cat backed off, so Littley, keen for a game followed him. Suddenly the ginger one (who I now call Putin) turned and made a swipe at Littley, who headed back to the cat flap at speed with Putin in hot pursuit. The Little Prince became cornered between the wall the the kitchen door - if he attempted to get through the flap, he would have his hindquarters torn and bitten - if he stood his ground, he would get a severe mauling from the bigger cat. I intervened and quickly opened the kitchen door, allowing Littley to dash in unharmed. Borders separate territories…The ginger cat had done a ‘Putin’ on the Little Prince - after pledging nose-touching friendship, during their catwalk criss-crossing of the territory chequerboard a few days before – and although my Obama-Like show of strength, which indeed sent the invader-cat scattering, worked in the short-term, I have drawn the line at an all-out Bush-Blair conflict-because the collateral damage could be just too great. …I came home around a year ago, to find Littley sitting motionless and breathing very rapidly – he wouldn’t respond to my talking or stroking him and he wouldn’t look at me. So I took him to the Vet’s straight away – just as well I did, as he was running a very high temperature, which took two days and different antibiotics to bring down – The vet reckoned that he’d had some kind of trauma, which was reinforced when I got him back home and found big tufts of his fur all over the house. There was no evidence that another cat had managed to get in and the cat-flap is a microchip one anyway, so I can only think it must have been through shock and fear. I tried to work out what the trauma was and although I can’t be sure, I do know that since the incident, he is afraid of other cats, whereas before he was very friendly – also the neighbourhood cat street-gang suddenly stopped hanging around my front door. The Minister who conducted my Mother’s funeral, more or less refused to allow me to read a poem by EE Cummings because it showed a certain doubt about the existence of Heaven – it was the first line that bothered him. If there is no doubt, no struggle to understand, no confrontation in the wilderness and dialogue with the ‘Devil’ – there can be no triumph and salvation – only fear and unthinking compliance – which seems to me to be the sure road to Hell. During the funeral, the Minister also proclaimed that the only way to Heaven was through Jesus Christ. The fact that he said it to a congregation that included my friend Amir, who is and looks Muslim, made me angry at the barriers, limitations and therefore alienation religion can create. 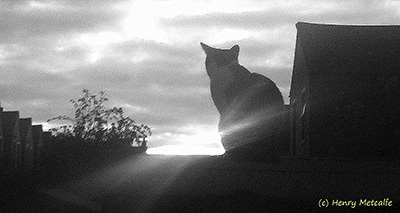 My little cat, after spending the day skirting (and breaching) the borderlines of his world, watches the sun setting from on top of the garden shed, then hunts under the Moon and wakes me in the morning with noisy, joyful head-butting. Thanks Jen and Bob, It's so good to hear from you...and now I think I should turn up again!! !